There’s an energy in the room at Matt Martin’s inaugural Charity Poker Tournament. Mesita – a Mexican lounge/restaurant in Rockville Centre on Long Island – is at capacity. There has to be energy here because Matt Martin is hosting the event, and everything Martin does is electric. There’s hooting and hollering from every direction. Fourteen tables make for a lot of noise, especially when Islanders players are brushing elbows with fans and keeping tabs on their teammates’ chip stacks at other tables. That doesn’t account for the spectators, fans hanging around the bar or those going to Sydney Esiason’s booth. Even the silent auction is loud and Martin needs several tries to get the crowd to settle to hear the rules. Buy-ins are allowed for the first hour only. One-hundred dollars equals $2,000 in chips. Whoever knocks out an Islander gets a signed jersey. With that, cards are dealt and the tournament takes off. The night is about poker and it isn’t. For the fans, it’s a chance to play cards, sit in an intimate venue and get to know the Islanders. For Martin, Max Feinberg, Bryan Calka and Brian Sigler, it’s about getting the Matt Martin Foundation off the ground. Martin kicked around the idea of starting a foundation for several years, but made it official this summer. 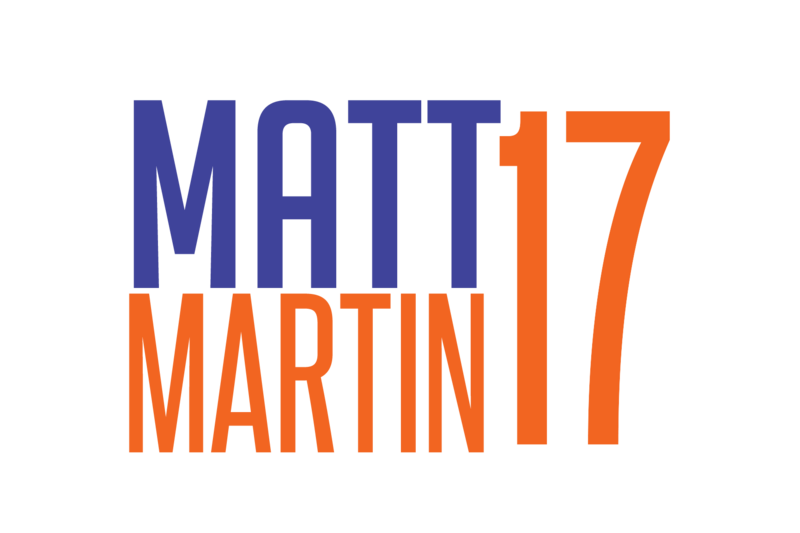 The Matt Martin Foundation’s mission is to raise money for causes close to Martin’s heart. Currently, the MMF is fundraising for the NYPD Widows and Children’s Fund, the Association for Children with Down Syndrome, the Boomer Esiason Foundation for Cystic Fibrosis and the Islanders Children’s Foundation. Martin said he’s fortunate that he hasn’t encountered any serious tragedies personally, but one look at his charities of choice and there are obvious connections. The 26-year-old is in a relationship with Sydney Esiason, whose brother Gunnar has Cystic Fibrosis. Gunnar and Martin are close friends, so last season, Martin and Cizikas started a program where they invited a guest with CF to home games, before meeting them and taking a picture by the Islanders locker room. They also help raise awareness for the condition. Martin was already working with Defending the Blue Line, a foundation that supports military families through hockey, so partnering with the NYPD Widows and Children’s Fund is a natural extension. Martin, like his teammates, is already heavily involved with the Islanders Children’s Foundation at annual events like the team’s Golf Outing and Casino Night. The fourth cause is ACDS – a special-needs school in Plainview for children with autism and down syndrome. The connection is less obvious, but the school was brought to his attention this summer when Martin met a man at the Belmont Stakes whose daughter had down syndrome. He told Martin the support services for down syndrome weren’t as developed, but also told him about the school in Plainview. It only took one visit for Martin and his team to add the school to their list of causes. The three trustees handle most of the behind-the-scenes work in the Foundation, but all four are working on it in addition to their full-time day jobs. Calka works for the New York Yankees while Feinberg organizes sports camps, including Matt Martin’s Hockey Academy at Twin Rinks in August. Martin brings a lot to the charity in terms of publicity. He can use his existing status as an NHLer and fan favorite – he’s won the fan-voted Bob Nystrom Award four years in a row – to garner media attention and pack a venue. He can also bring his teammates. The guest list included Johnny Boychuk, Nick Leddy, Ryan Strome and Casey Cizikas, who was the last Islander standing at the tables. Martin’s positivity and energy make it easy for people to buy in. He wants to see the foundation grow, be able to put on more events, raise more money and support more causes. Mesita hadn’t even been cleaned up, and yet the group is already thinking ahead. They are planning hockey clinics in the winter and hockey camps for next summer and there’s talk of more charity fundraisers – bowling is an idea being rolled out. Poker night raised $45,000, but the group still needs to debrief. Also, the NHL season means the next events will have to be planned strategically. The poker event was more than a good start, as $45,000 is a substantial sum in a room of fewer than 250 people. Poker shark Emily Hiltzik won the tournament, though the Foundation won the night, introducing itself to the community in grand fashion.